Division of Vector Ecology and Surveillance, Vector Control Research Centre, Indian Council of Medical Research, Puducherry, India. Introduction: Rheumatod Arthritis (RA) is the most common autoimmune arthritis, associated with accelerated atherogenesis and increased cardiovascular mortality. An apparent lipid paradox exists in RA. Active RA with high burden of inflammatory markers leads to low levels of LDL-C, Total cholesterol, HDL-C and vice versa in inactive disease. The current study was aimed to assess the relationship between inflammatory markers and lipid components in RA patients. Methods: The study was conducted at a Rheumatology clinic of a Tertiary care hospital and included 203 RA patients. Fasting blood samples were drawn for lipid analysis and inflammatory markers (ESR/CRP). Relationship between the two was assessed using Pearson’s correlation method. Results: Out of 203 patients, 180 were female (89%) and 23 were males (11%). Mean duration of disease was 2.55 ± 2.09 years and mean age was 47 ± 10.9 years. The mean total cholesterol, HDL-C, LDL-C and triglycerides were 198.6 ± 43.6 mg/ dl, 41 ± 8.2 mg/dl, 109 ± 28 mg/dl and 224.8 ± 89 mg/dl respectively. Mean ESR was 37mm in 1st hour and mean CRP was 9.6 mg/dl. A statistically significant negative correlation was found between CRP and total cholesterol (p<0.001), CRP and HDL-cholesterol (P<0.001), CRP and LDL-cholesterol (P<0.001). Similarly, a negative correlation was found between ESR and HDL-cholesterol (p<0.001). However, no significant correlation was found between ESR and total cholesterol and/or LDL-cholesterol. Triglycerides and VLDL-cholesterol were found to have no significant correlation with inflammatory markers in our study. Conclusion: RA is a disease with lipid paradox. A high inflammatory burden is associated with low level of HDL-C, LDL-C and Total cholesterol. Rheumatoid Arthritis is a pro-atherogenic disease associated with increased cardiovascular (CV) mortality [1,2]. Chronic inÃ¯Â¬Âammation has emerged as a pivotal component implicated in the development of this process. A chronic high inÃ¯Â¬Âammatory burden, determined by the mean values of C-reactive protein (CRP) and/or ESR is associated with increased risk of CV events [3-5]. The presence of a pro-inÃ¯Â¬Âammatory state leads to a decrease of total cholesterol, HDL cholesterol and LDL cholesterol in patients with active RA . Paradoxically, anti-inÃ¯Â¬Âammatory therapies increase total cholesterol, HDL cholesterol and LDL cholesterol to variable degrees in patients with RA . This lipid increase is not associated with a rise in the number of CV events in these patients. Contrary to this, probably due to the anti-inÃ¯Â¬Âammatory effect, conventional disease-modifying anti-rheumatic drugs, such as methotrexate, and different biological agents have demonstrated a reduction of the CV death rate in patients with RA [8-11]. The reduction in the rate of CV events seems to be directly related to better control of the rheumatic disease. Data on RA and dyslipidemias is very limited in this part of the world. Therefore, the current study was undertaken to study the lipid profile of RA patients and its correlation with inflammatory markers (ESR/CRP). The current study was carried out at Rheumatology Referral clinic of a tertiary care hospital in Srinagar city, Jammu and Kashmir India catering a population of around 60 lakhs. Patients of Rheumatoid Arthritis who visited OPD were enrolled into the study after fulfilling inclusion criteria. A proper consent was taken from each patient. The study was cleared by the Institutional ethical committee. 1. Patients of Rheumatoid arthritis diagnosed by 2010 ACR-EULAR criteria. 2. Age-group of above 20 years. 3. Disease duration of more than 6 months. 4. Receiving Disease Modifying Anti Rheumatic Drugs (DMARDS). 7. Obesity (body mass index >30). 8. Patients receiving drugs: Lipid-lowering drugs, betablockers, oral contraceptives, estrogen, progestin, thyroxin and vitamin E.
Blood samples were collected in the morning after 10 hours of overnight fasting. Serum concentrations of total cholesterol, LDL-C, HDLÃ¢ÂÂC, and triglycerides were measured using an automated chemistry analyzer with reagents from the same manufacturer. Serum glucose, uric acid, kidney function test, liver function test and hemogram were determined by standard methods in routine use. C reactive protein (CRP), erythrocyte sedimentation rate (ESR) was measured to assess the inflammatory burden. The statistical analysis was carried out using the Statistical Package for the Social Sciences (SPSS), Version 20. Mean, standard deviation/standard error of mean, and percentage were used wherever applicable, to analyze patient’s characteristic description. A p-value of ≤0.05 was considered to be statistically significant. Pearson’s correlation was applied to find relationship between lipid components and inflammatory markers. A total of 203 consecutive Rheumatoid Arthritis patients were included in the study. Females 89% (n=180) outnumbered males (n=23). Mean age of the patients was 47 ± 10.92 years (range 23-69 years). Duration of disease ranged from 1-10 years with a mean of 2.55 ± 2.09 years. The mean total cholesterol was 198.6 ± 43.6 mg/dl with a range of 109-320 mg/dl, whereas the mean HDL-C was 41 ± 8.2 mg/dl with a range of 26-60 mg/dl and a mean LDL-C of 109 ± 28 mg/dl with a range of 50-189 mg/dl. The mean triglycerides were 224.8 ± 89 mg/dl with a range of 69-470 mg/dl, were found to be increased as would be expected in inactive disease. The mean VLDL was 44.82 ± 19 with a range of 13-120 mg/dl. The mean TC/HDL ratio was 4.98 ± 1.33 with a range of 2.4-10. Mean ESR was 37mm in 1st hour with a range of 5-120 and mean CRP was 9.6 mg/dl with a range of 1-56 mg/dl which implies a low burden of inflammation in our study patients (Table 1)..
Table 1 Distribution of various parameters of study patients. A statistically significant but negative correlation was found between CRP and total cholesterol (p <0.001), CRP and HDLcholesterol (p<0.001), CRP and LDL-cholesterol (p<0.001). Similarly, a negative correlation was found between ESR and HDLcholesterol (p<0.001). While as, no significant correlation was found between ESR and total cholesterol and/or LDL-cholesterol (Figures 1-4). Triglycerides and VLDL-cholesterol were found to have no significant correlation with inflammatory markers in our study. 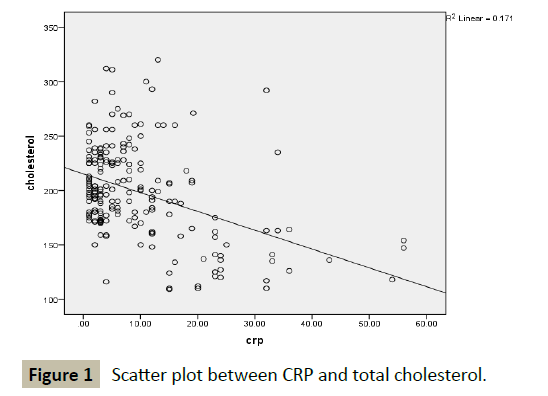 Figure 1 Scatter plot between CRP and total cholesterol. 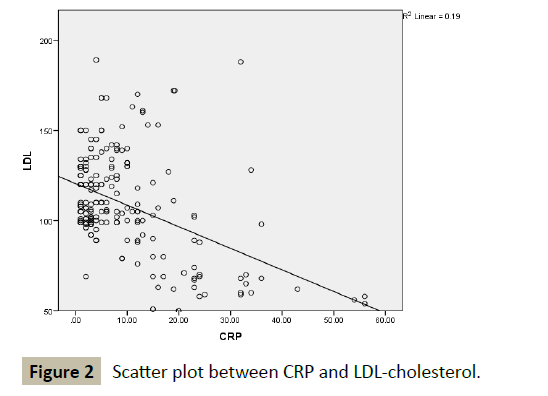 Figure 2 Scatter plot between CRP and LDL-cholesterol. 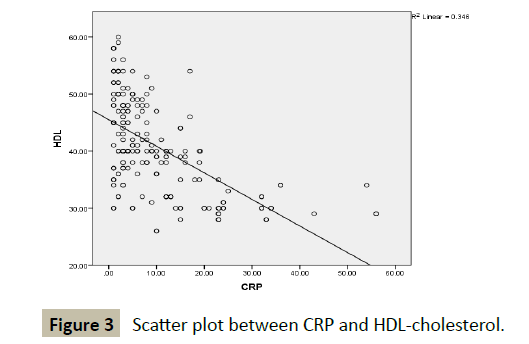 Figure 3 Scatter plot between CRP and HDL-cholesterol. 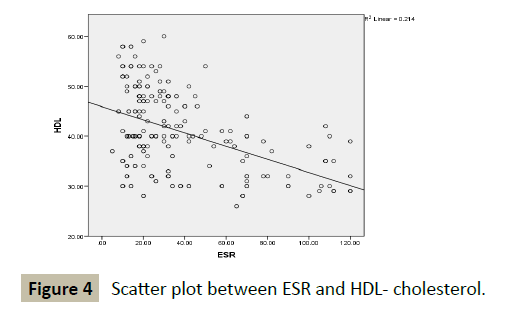 Figure 4 Scatter plot between ESR and HDL- cholesterol. Rheumatoid Arthritis patients on anti-inflammatory agents were included in the study aiming to find relationship between inflammatory markers and lipid components. In previous studies [12-15], mean cholesterol in inactive RA patients was found to be 200 mg/dl, which is in accordance with the present study (198 mg/dl). Mean LDL in current study was 109 mg/dl which is comparable to as reported in other studies [16,17]. However, mean HDL (41 mg/dl) was slightly less in our study patients as compared to the earlier studies by Curtis et al. and Chen et al. but was found in consonance with other studies [16,19]. Low HDL-C in the study patients could be as a result of genetic/ environmental factors, wherein HDL-C is low in overall population in this part of the world. Mean triglycerides were 224 mg/dl which were in accordance with the previous studies [17,20]. The mean atherogenic index (TC/HDL) of 4.98, suggests a low CV risk (>5 suggests increased risk), while as mean TC/HDL-C ratio was 5.28 in Muzahim et al. , but the mean inflammatory markers were increased in their study patients. The increase in lipids in current study population represents the lipid paradox which is seen in patients of RA who are receiving anti-inflammatory agents and have lower levels of inflammatory markers. However, this increase doesn’t enhance CV disease risk but denotes a decrease in inflammatory burden. A statistically significant but negative correlation was found between CRP and total cholesterol (-0.414), LDL cholesterol (-0.442) and HDL cholesterol (-0.588) which was in accordance with studies done by Douglas et al. , Robertson J et al. and Athanasios et al. Hyon K Choi et al. also found a negative correlation between HDL and CRP. Our study found a negative correlation between ESR and HDL Cholestrol (-0.463) which is in accordance with Douglas et al. and Athanasios et al. . The current study found no correlation between ESR and Total Cholesterol and LDL cholesterol as reported by Douglus et al. . ESR has been found as a poor representative of inflammatory markers and its levels can be falsely high in presence of high titres of Rheumatoid Factor. Muzahim et al. reported a positive correlation between TG and CRP /ESR but other studies [18,20,22] have found no such correlation. VLDL cholesterol and TG were found to have no significant relationship with ESR and CRP. The increase in TG in current study may be part of metabolic syndrome, the prevalence of which increases in RA patients. A high inflammatory burden determined by values of ESR and CRP in active disease is associated with low lipid levels. A negative correlation exists between inflammatory markers ESR/ CRP and lipids. Treatment with anti-inflammatory agents leads to a paradoxical increase in lipids, but this lipid increase may not be associated with increased CV risk events. In conclusion, despite the apparent paradox between the lipid profile and inflammation, clinicians should keep in mind that statins need to be considered in the management of patients with RA. Gonzalez-Gay MA, Gonzalez-Juanatey C, Martin J (2005) Rheumatoid arthritis: A disease associated with accelerated atherogenesis. Semin Arthritis Rheum 35: 8–17. Aviña-Zubieta JA, Choi HK, Sadatsafavi M, Etminan M, Esdaile JM, et al. (2008) Risk of cardiovascular mortality in patients with rheumatoid arthritis: a meta-analysis of observational studies. Arthritis Rheum 59: 1690–1697. Gonzalez-Gay MA, Gonzalez-Juanatey C, Piñeiro A, Porrua GC, Testa A, et al. (2005) High-grade C-reactive protein elevation correlates with accelerated atherogenesis in patients with rheumatoid arthritis. J Rheumatol 32: 1219–1223. Gonzalez-Gay MA, Gonzalez-Juanatey C, Lopez- Diaz MJ, Eiro AP, Porrua GC, et al. (2007) HLA-DRB1 and persistent chronic in Ã¯Â¬Â ammation contribute to cardiovascular events and cardiovascular mortality in patients with rheumatoid arthritis. Arthritis Rheum 57: 125–132. Myasoedova E, Crowson CS, Kremers HM, Roger VL, Fitz-Gibbon PD, et al. (2011) Lipid paradox in rheumatoid arthritis: The impact of serum lipid measures and systemic inÃ¯Â¬Âammation on the risk of cardiovascular disease. Ann Rheum Dis 70: 482–487. Robertson J, Peters MJ, McInnes IB, Sattar N (2013) Changes in lipid levels with inÃ¯Â¬Âammation and therapy in RA: A maturing paradigm. Nat Rev Rheumatol 9: 513–523. Van Sijl AM, Peters MJ, Knol DL, De Vet RH, Sattar N, et al. (2011) The effect of TNF-alpha blocking therapy on lipid levels in rheumatoid arthritis: a meta-analysis. Semin Arthritis Rheum 41: 393–400. Choi HK, Hernán MA, Seeger JD, Robins JM, Wolfe F, et al. (2002) Methotrexate and mortality in patients with rheumatoid arthritis: a prospective study. Lancet 359: 1173–1177. Greenberg JD, Kremer JM, Curtis JR, Hochberg MC, Reed G, et al. (2011) Tumour necrosis factor antagonist use and associated risk reduction of cardiovascular events among patients with rheumatoid arthritis. Ann Rheum Dis 70: 576–582. Barnabe C, Martin BJ, Ghali WA (2011) Systematic review and meta-analysis: Anti-tumor necrosis factor α therapy and cardiovascular events in rheumatoid arthritis. Arthritis Care Res (Hoboken) 63: 522–529. Dixon WG, Watson KD, Lunt M, Hyrich KL (2007) Reduction in the incidence of myocardial infarction in patients with rheumatoid arthritis who respond to anti-tumor necrosis factor alpha therapy: Results from the British Society for Rheumatology Biologics Register. Arthritis Rheum 56: 2905–2912. Svenson KL, Lithell H, Hallgren R, Selinus I, Vessby B (1987) Serum lipoprotein in active rheumatoid arthritis and other chronic inÃ¯Â¬Âammatory arthritides. I. Relativity to inÃ¯Â¬Âammatory activity. Arch Intern Med 147: 1912-1916. Svenson KL, Lithell H, Hallgren R, Vessby B (1987) Serum lipoprotein in active rheumatoid arthritis and other chronic inÃ¯Â¬Âammatory arthritides. II. Effects of antiinÃ¯Â¬Âammatory and disease-modifying drug treatment. Arch Intern Med 147: 1917-1920. Rantapaa-Dahlqvist S, Wallberg-Jonsson S, Dahlen G (1991) Lipoprotein (a), lipids and lipoproteins in patients with rheumatoid arthritis. Ann Rheum Dis 50: 366-368. Lazarevic MB, Vitic J, Mladenovic V, Myones BL, Skosey JL, et al. (1992) Dyslipoproteinemia in the course of active rheumatoid arthritis. Seminars in Arthritis and Rheumatism 22: 172-178. Dursunoglu D, Evrengul H, Polat B, Tanriverdi H, Cobankara V, et al. (2005) Lp (a) lipoprotein and lipids in patients with rheumatoid arthritis: serum levels and relationship to inflammation. Rheumatol Int 25: 241–245. Curtis JR, Baser O (2012) Dyslipidemia and changes in lipid profiles associated with rheumatoid arthritis and initiation of anti-TNF therapy; Arthritis Care Res (Hoboken) 64 (9): 1282-1291. Chen DY, Chen YM, Hsieh TY, Hsieh CW, Lin CC, et al. (2015) Significant effects of biologic therapy on lipid profiles and insulin resistance in patients with rheumatoid arthritis. Arthritis Res Ther 17: 52. Vinapamula KS, Manohar SM, Bitla AR, Kanduri R, Bhattaram SK, et al. (2013) Evaluation of dyslipidaemia in patients with rheumatoid arthritis in South Indian population. Indian Journal of Rheumatology 8(4): 155-160. White D, Fayez S, Doube A (2006) Atherogenic lipid profiles in rheumatoid arthritis. Journal of the New Zealand Medical Association 119: 1-3. Robertson J, Peters MJ, McInnes IB, Sattar N (2013) Changes in lipid levels within Ã¯Â¬Âammation and therapy in RA: A maturing paradigm. Nat Rev Rheumatol 9: 513–523. Georgiadis AN, Papavasiliou EC, Lourida ES, Alamanos Y, Kostara C, et al. (2006) Atherogenic lipid profile is a characteristic of patients with early rheumatoid arthritis: Effect of early treatment - A prospective study. Arthritis Res Ther 8(3): R82. Choi HK, Seeger JD(2005) Lipid profiles among US elderly with untreated rheumatoid arthritis - The Third National Health and Nutrition Examination Survey. J Rheum 12: 2311-2316.